The Animal Review book (Bloomsbury USA) is now available. 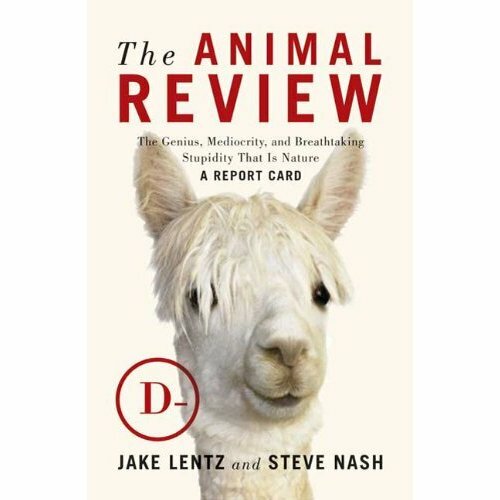 If you enjoy The Animal Review blog, or if you are just looking for an innocuous gift idea, consider purchasing it from Amazon, Barnes & Noble, Borders, and/or Target. Or if you’re feeling particularly ambitious, try a local independent bookstore. Yay! Got my copy today – can’t wait to read it! If I look at this book and there’s no review of the grizzled bear I’m going to laugh very hard. The site has had that darn g. bear pic up on the masthead FOREVER and still no review. Just sayin, it’d be funny. Love the book! So much greatness. I showed the book to a friend, well… I thought it was a friend… and he was like “I don’t get it.” I promptly unfriended him on Facebook. Yeah. This is a great find and came to me via another brilliant site, Blue Avocado! This book is wicked funny. My daughter was studying for ACT’s and I couldn’t help interrupting her with a few paragraphs from the book. We ended up laughing and reading aloud for a couple of hours. This book is great. I think it should be part of the high school biology cirriculum. Thanks Bert! We’re doing what we can to make this assigned reading for all human beings. i’ll look into it! thanks for sharing!